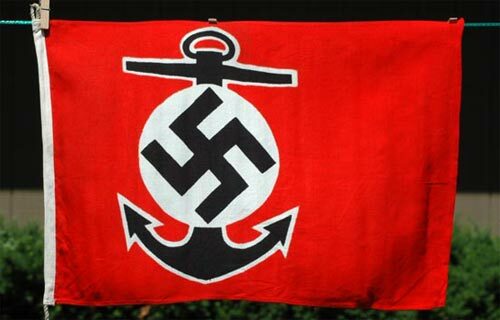 Home > Catalog > Third Reich > Kriegsmarine > Uniforms, Insignia, Books, etc. Insignia of the Navy Regatta Association, flag of the water sports vessels. Used on all Navy owned sail boats and yachts. Red cloth body, 52x35 cm, printed, two sided, mirror reverse, loop and line hoist, unmarked, strong colors, a little dirt on the back, near mint, very light wear.